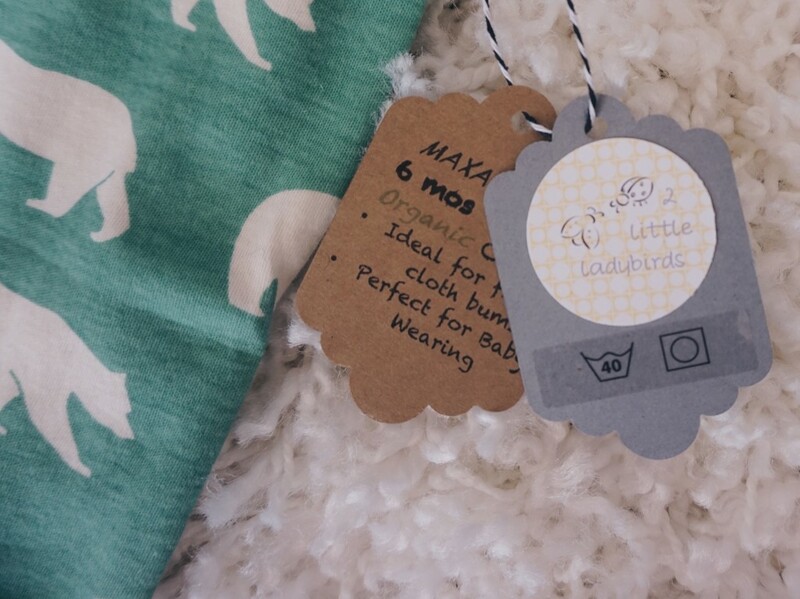 2 Little Ladybirds Maxaloones Giveaway! I absolutely LOVE maxaloones! Maxaloones are pants that grow with your baby. 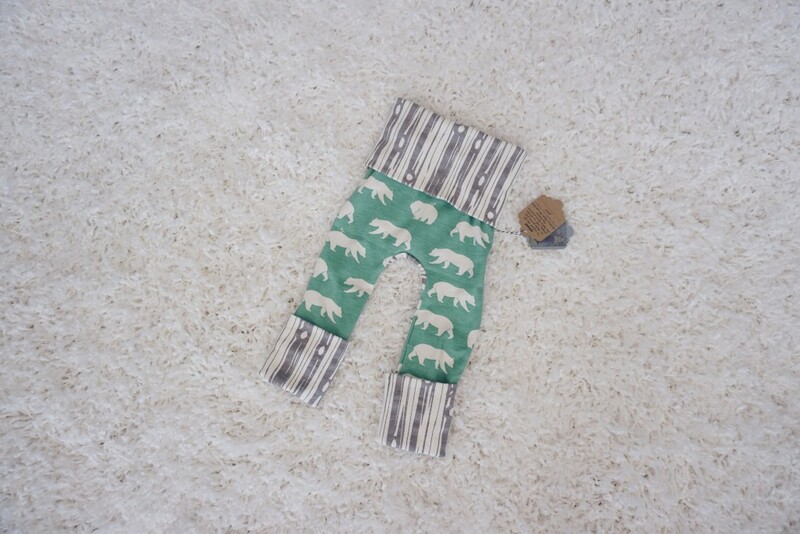 This pair of maxaloones by 2 Little Ladybirds fits from 6months-3 years just by rolling or unrolling the bottom and waist. Is that crazy or what?! I call these magic pants. 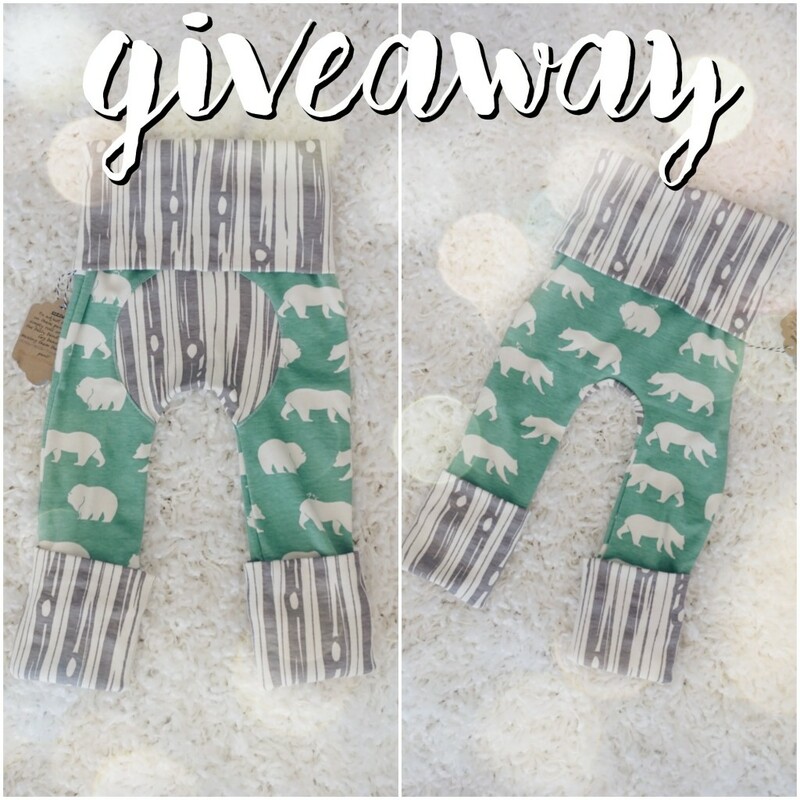 I’ve teamed up with 2 Little Ladybirds to give this adorable pair to one lucky winner. All you have to do to win is head to my instagram and like this photo, follow me and 2 Little Ladybirds, and tag 3 friends. Easy peasy! 2 Little Ladybirds makes super high quality pants. 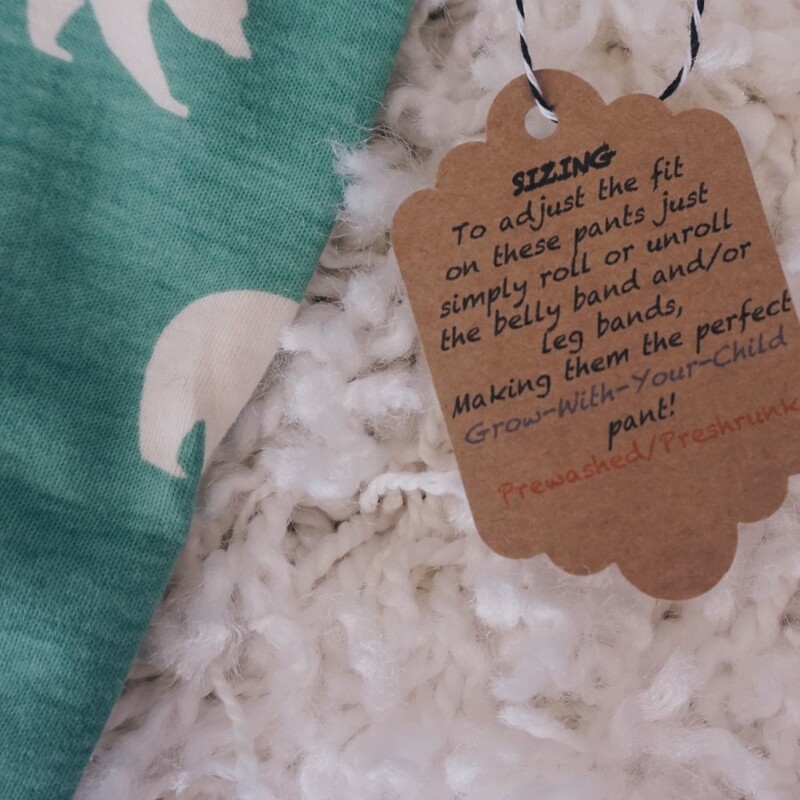 The fabric is not only organic, but it is amazingly soft and stretchy. 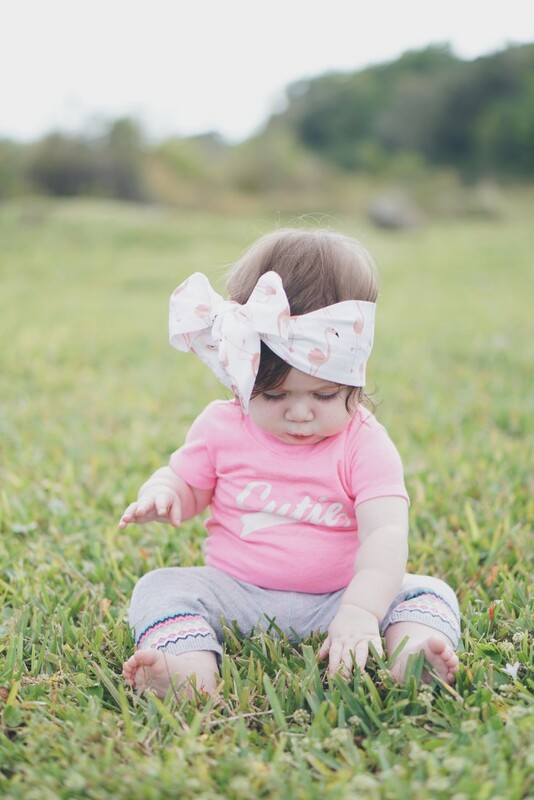 I love these pants because they are like yoga pants for babies! Maxaloones are perfect for any baby, but especially for cloth diapered babies because they actually fit over that cloth bum! 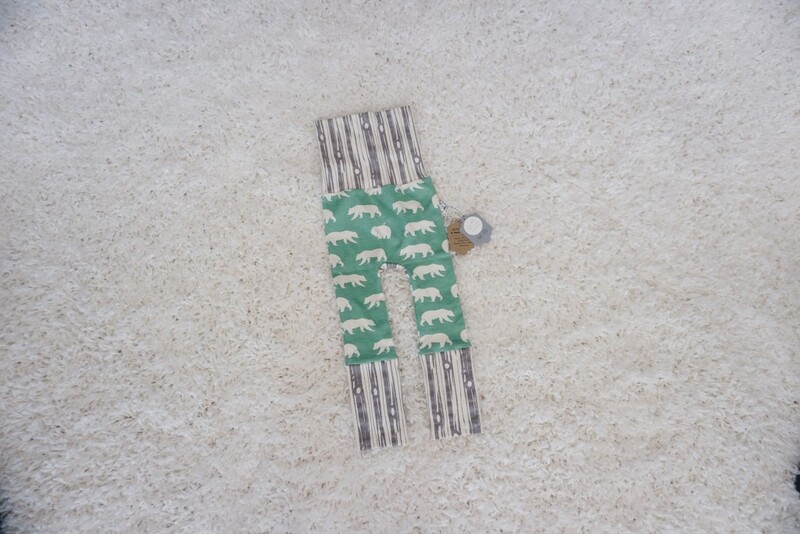 Here is what the pants look like completely unrolled. This would be the size for a three year old. I love this pattern because it is gender neutral! 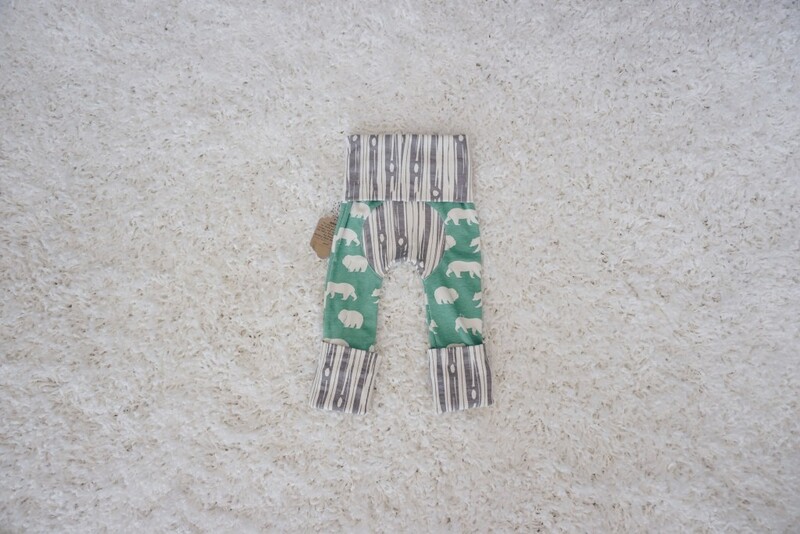 And here are the pants when the bottom legs are cuffed and the waist is cuffed! This would be the perfect size for a 6 month old! Head on over to my instagram to win this pair of Maxaloones! Giveaway ends in 48 hours (April 9th). Ever since Gracie was born, I’ve been on the hunt for the best wipes. I tend to lean more towards the natural, least ingredient wipes out there, but have also tried generic brands, too. 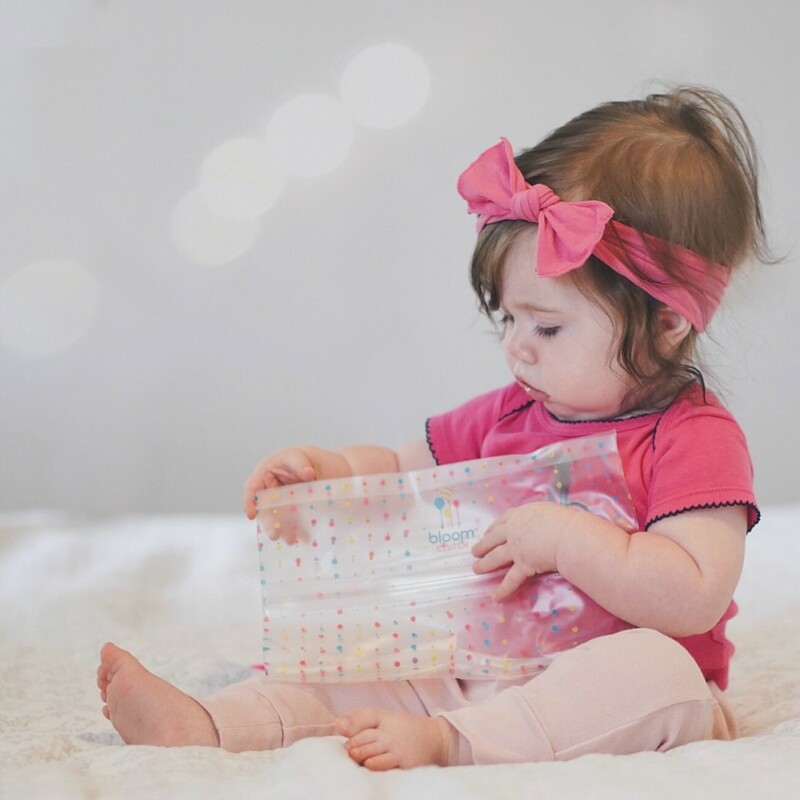 I’ve tried lots of different kinds… including Water Wipes, Pampers, and Huggies. 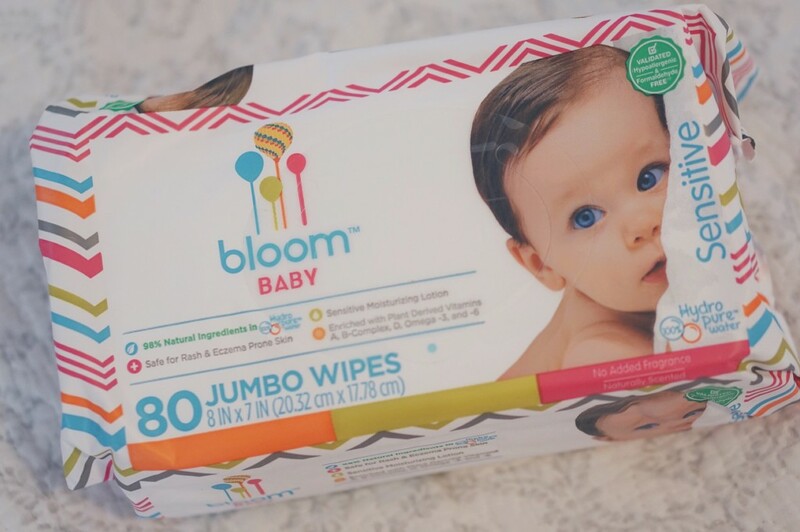 I haven’t LOVED any particular brand until I tried Bloom Baby Sensitive Wipes. I did receive a box in exchange for my thoughts, but these opinions are completely my own. I did a lot of research to find the best wipes, and I kept stumbling upon this brand. So I had to give them a shot and Bloom Baby was kind enough to send some over! The first thing I love about these are the price for what you’re getting. You get a huge box of wipes (640) with 80 wipes coming in each pack. I just love how the packs are bigger than other wipe companies. 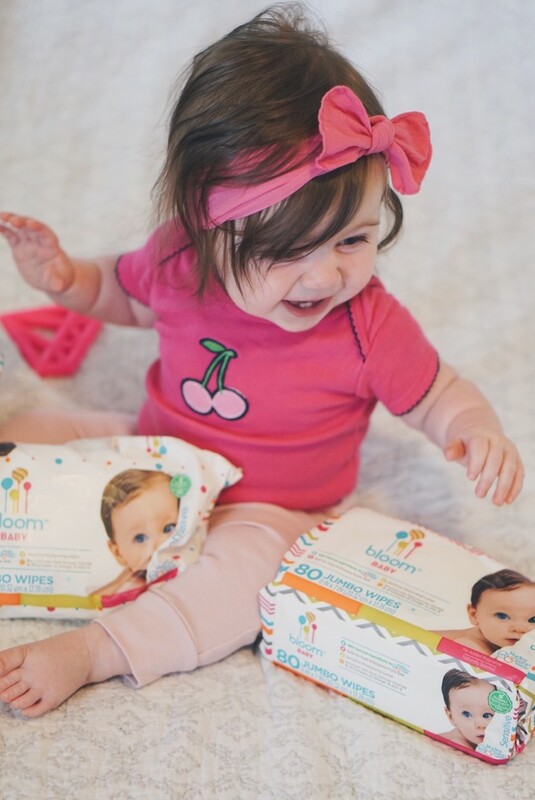 Usually about 60 wipes come in a pack, but with Bloom Baby you get more! I love the ingredients in Bloom Baby wipes. They are safe for rash and eczema prone skin because of the all natural ingredients inside. They are made with hydro-pure water with no added fragrance. I love how they are made with water, but not ONLY water. I tried water wipes (which are made of 99% water), and they just did not get the “job” done. I felt like I had to use a million wipes. 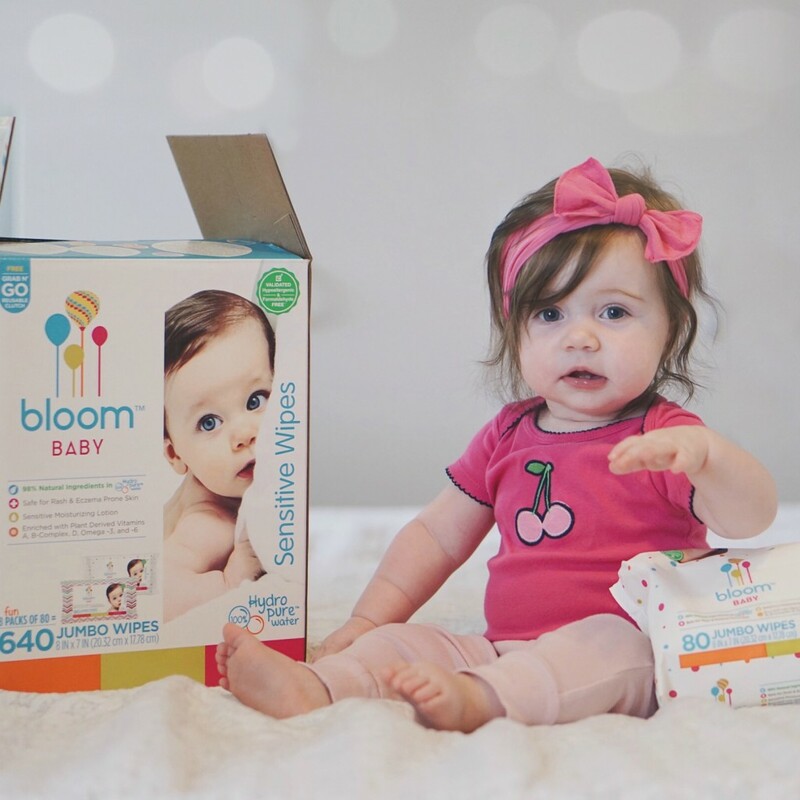 But with Bloom, they definitely work, but are safe from all the nasty chemicals! 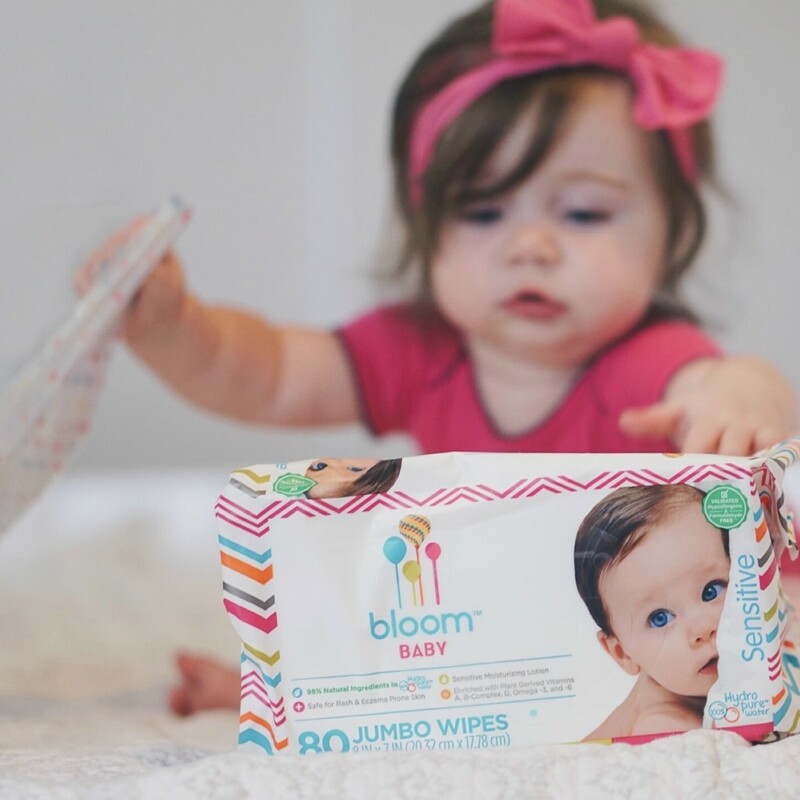 The Bloom wipes are also very moisturizing because they contain lotion that is meant for sensitive skin. 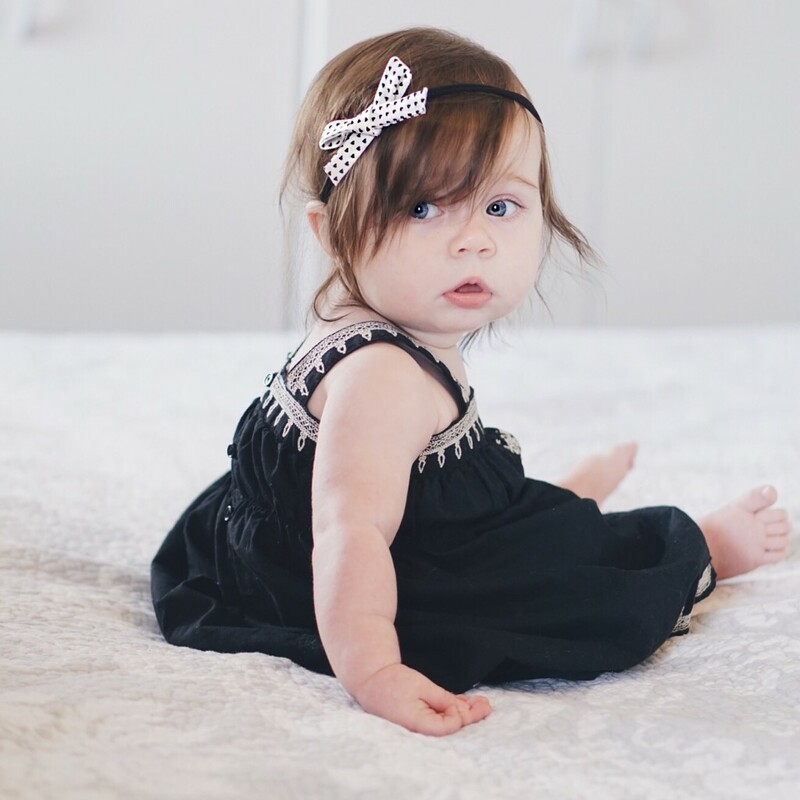 Gracie doesn’t have overly sensitive skin, but certain things will cause a few bumps. So, I like knowing I’m using the minimum irritants on her precious skin. I like comparing them to Pampers wipes, just cause that’s what I had been using. 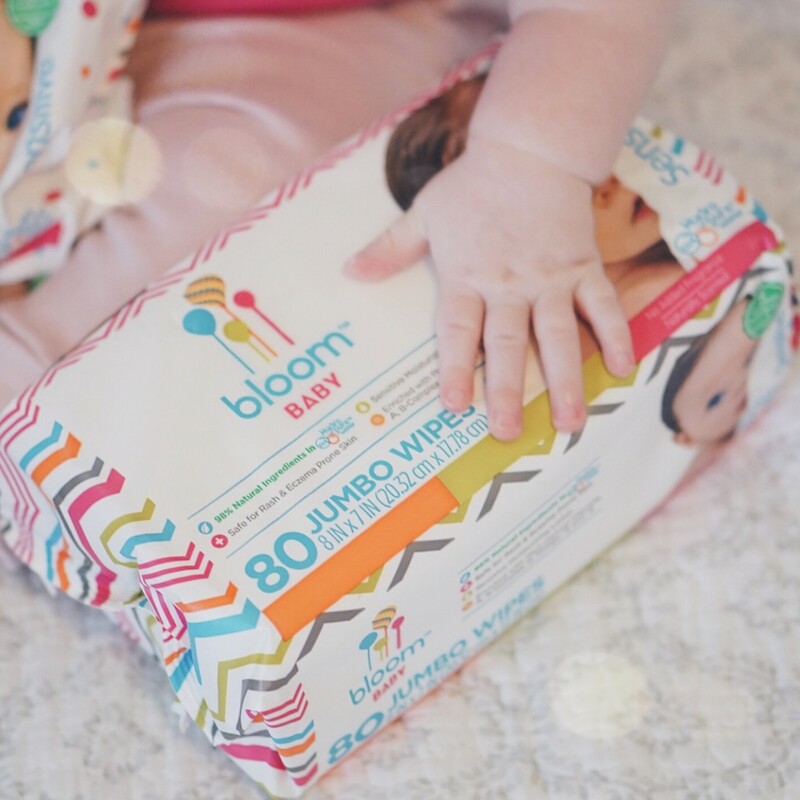 With Bloom Baby sensitive wipes, you also get larger wipes. I also like the texture on the Bloom Baby wipes. I feel like it helps grab.. ya know.. the stuff better than other wipes. When you’re changing a lot of diapers, you start to get REALLY picky on what your using. EFFICIENCY, PEOPLE. Last but not least, you get an awesome free travel clutch in each box! These are so handy to have around. I love throwing this in the diaper bag or even keeping one in the car for when I run out. 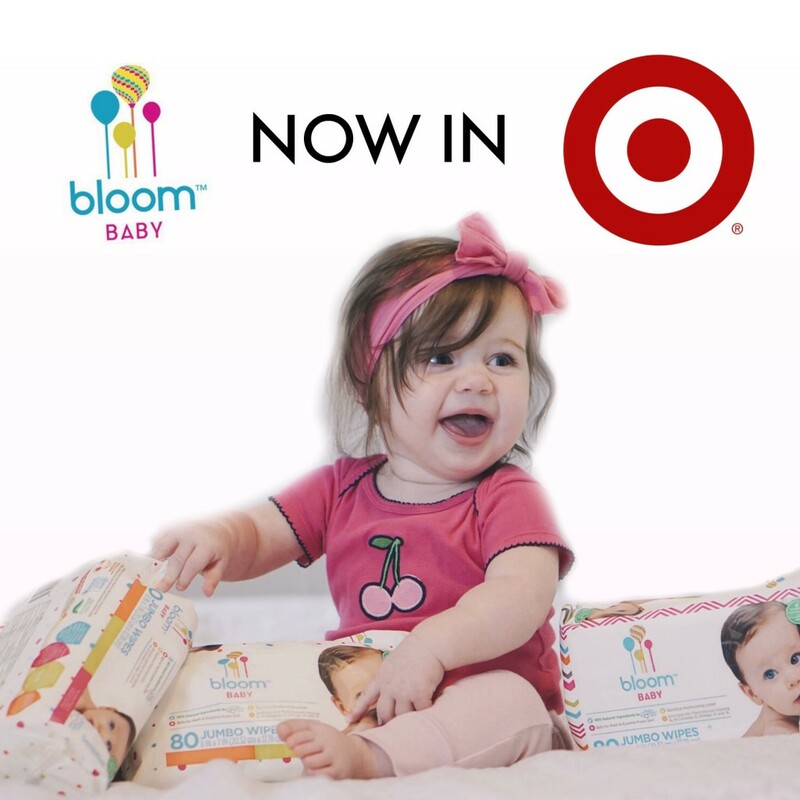 Bloom Baby actually just announced that they are going to be launching in TARGET on April 7th!! How exciting is that! I’ll definitely be picking up my next box at Target. 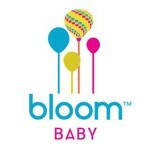 Bloom Baby wipes are available online at target.com. To see if they are available in your nearest target go to the product page and it will tell you the nearest store for a pick-up or you can find them in other stores by clicking the “find in another location”! I can’t wait for you to try these! 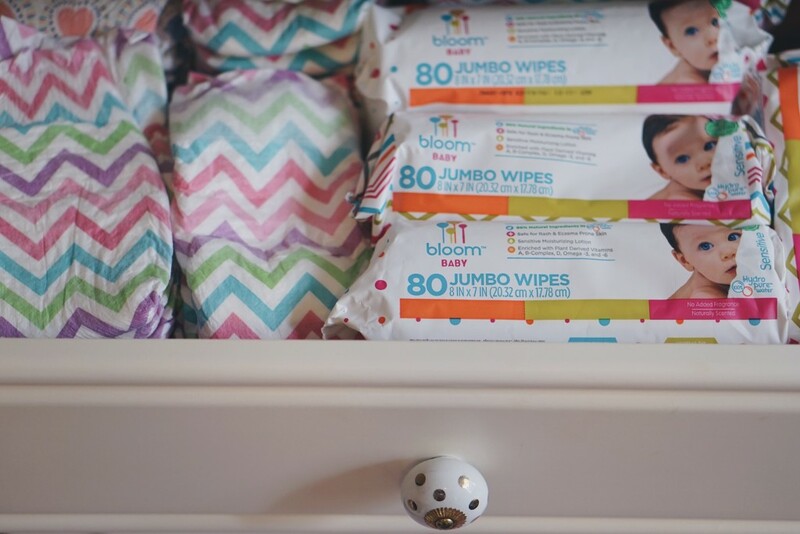 You can also purchase Bloom Baby wipes on Amazon and at Sam’s Club! Like them on Facebook to stay up to date on all their new products! I have recently discovered the community of brand repping. And have had tons of questions about what this all is. Basically a brand rep is someone who represents a brand by promoting that brand, taking high quality pictures, and helping the brand grow. In exchange, you receive either the product for free of for a hefty discount. Small shops will often hold a brand rep/enthusiast search. To enter, you usually have to repost the contest picture and write why you want to be a brand rep for that shop. 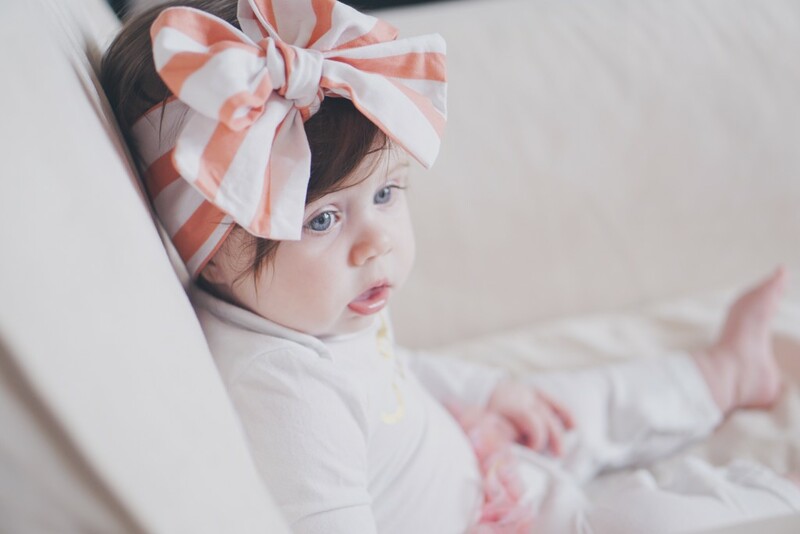 You also usually say a few things about your little one, like their age + personality. The small shop looks through all of the entries and will choose a few winners! Usually shops choose about 1-4 brand reps and around 10 enthusiasts. Brand reps usually receive the product for free, while enthusiast get a large discount off the product. 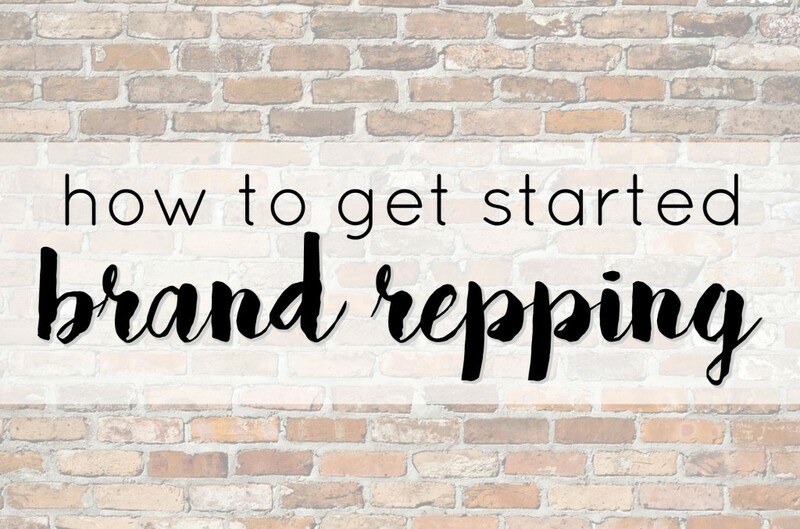 Working with a shop as a brand rep or enthusiast is a great way to support small businesses and support the women behind the shops. 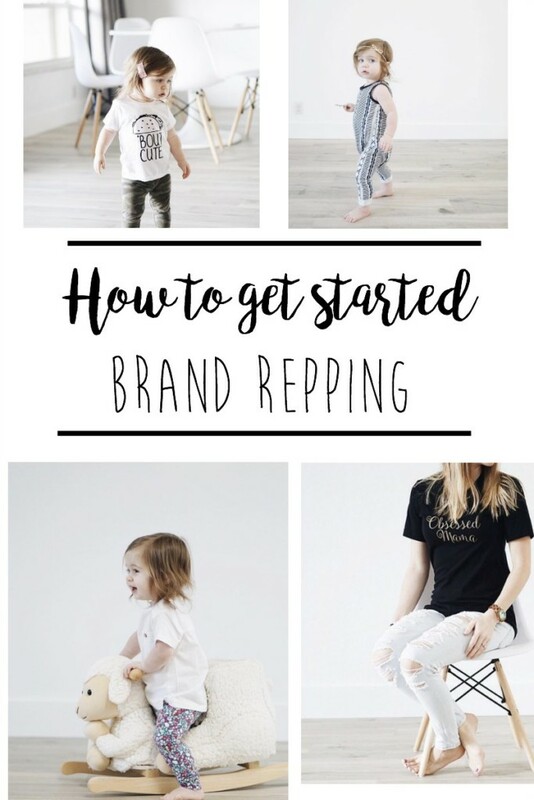 If you love supporting small shops and taking high quality pictures of your little one, you will love the world of brand repping. There are so many amazing shops and talented women and so many gorgeous kids, it only makes sense the two work together! Now, it’s definitely not about getting free items. While that is a perk, it actually takes a lot of time + sometimes money to truly help out a shop and take great pictures. You need to be able to hold up your end of the agreement. Shops are depending on those pictures to advertise and share on their social media + websites. So while it may seem easy to get free stuff and take photos, there’s actually a bit more to it! Just be sure your committed to it before you join! 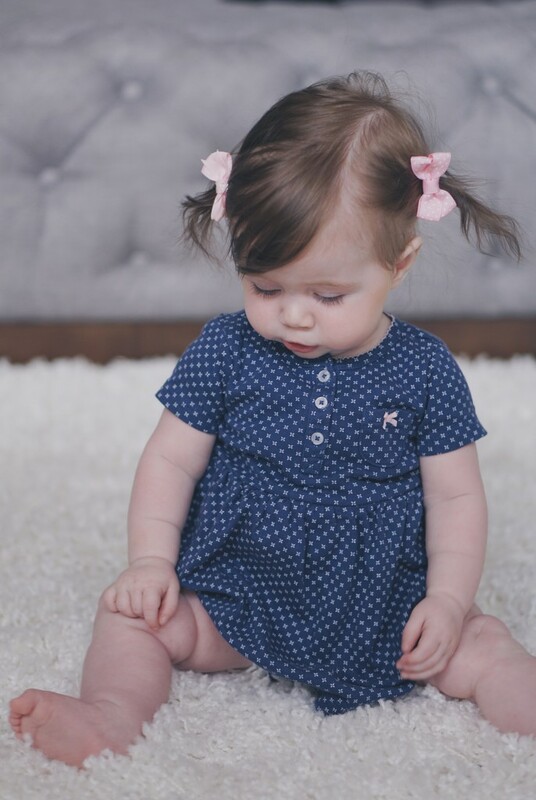 A couple of months ago, I entered Gracie girl into a few brand rep searches. Unfortunately she wasn’t chosen. It was a little disappointing because as a parent, you want your child to be chosen for everything! Lol! But, there is actually a LOT more too it than just a cute kid. Shops are looking for more than a pretty/handsome child. They want to see clear and bright photos that really highlight the product. Make sure there are no distractions in the background! Shops also want to see you engage with your followers. That means when you get comments on photos, comment back and start conversations. Shops also want to see a love for shopping small. So, start showcasing a few small shop items like handmade headbands or moccs in your posts. After Gracie wasn’t chosen for a few searches, I decided to up my instagram game a bit. I started focusing on my photo quality and my ability to showcase small shops! I entered in more searches, and Gracie was chosen for 5 in one week! This is such a fun hobby/passion I randomly discovered, but I am so glad I did! It’s been so much fun meshing a few of my passions together (photography, playing with Gracie, shopping, supporting other women) into one hobby. Let me know if you have any other questions!